People learned how to make thumbprint cookie recipes for many years; they were around even before I was born. Claims for the origination of this recipe have been traced back to Sweden, Poland, to the Jewish people who traveled and brought the recipes to Eastern Europe and many other countries. Like many great recipes, there are always many countries claiming the creation. When you learn how to make thumbprint cookie recipes, it will be obvious how the name was derived. After rolling the dough into small balls, the balls are rolled in finely chopped nuts or coconut. This is how the name comes into being; no with the thumb an indentation is made in each cookie. This indentation will be filled with jams, jelly, chocolate, icing or most anything you desire. Cooks learned how to make thumbprint cookie recipes and have developed a variety of recipes over the years; all I have tried have been really good. The dough recipe might be made plain, a chocolate, peanut butter or a variety of flavors; of course, the filling in the thumbprint can be mixed or matched as your taste buds desire. The first one that I am giving you is the original one that has always been on my list of Christmas cookie recipes. I like this one because it has a very good taste. It is light; more so than many of my cookie recipes. Many of my cookie recipes are very rich so I try to also include some which are not so rich. NOTE: Cookies, like thumbprint cookie recipes, require indent on top to fill with jam or chocolate. Use the rounded end of a honey dipper to make the indent. Combine and mix together the butter, sugar, egg and vanilla. Sift together the flour and salt and blend in with the creamed mixture. Roll dough into 1 inch balls, dip ball into slightly beaten egg white and roll in finely chopped nuts. Place on an unbaked cookie sheet. Bake 5 minutes. Remove from oven and gently press your thumb in the center of each cookie. Return to the oven and bake 8 minutes longer. Remove from oven and fill in the thumbprint. Fairly new to the thumbprint cookie recipes for me are these chocolate thumbprint cookies. This is a way to add that much desired flavor to your holiday recipes. Again, with this recipe a variety of ingredients can be used to fill the thumbprint. Melt half of the chocolate chips in a double boiler over hot water (not boiling). In a large mixing bowl, beat sugar and butter on medium speed until fluffy. Add eggs and vanilla and beat well. Add half of the melted chocolate and beat well. In a medium bowl, combine the oats, flour, baking powder and salt. Stir the flour mixture into the butter mixture until well blended. Wrap the dough in plastic wrap and refrigerate for 1 hour. Melt the remaining half of chocolate chips over the double boiler. Shape dough into 1 inch balls and place on an ungreased cookie sheets about 2 inches apart. Bake cookies 10 to 12 minutes (do not over bake). Remove from oven and press a cherry down in the center of each cookie. (If you want to use a filling instead of the cherries and the cookies are too hot for your thumb, use the end of a wooden spoon to make the thumbprint.) Drizzle remaining melted chocolate over the cookies. 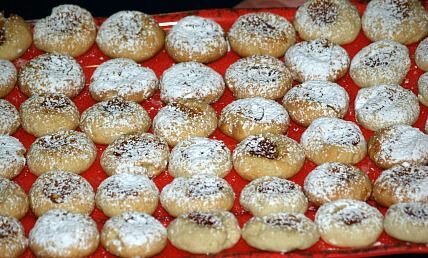 Thumbprint cookie recipes get their name because cookie is indented with the thumb of the hand and then filled with jams, jellies or other fillings. I do not know where this cookie originated but it has been around as long time in different forms. The following apricot filled cookies are made with a cream cheese cookie recipe. As with most desserts, cream cheese adds something extra to recipes and these cream cheese cookies are no different. This is a great combination of cream cheese and apricots. Combine butter, granulated sugar and cream cheese; mix until well blended. Add eggs, juice and lime peel and blend in. Combine flour and baking powder; blend in with creamed mixture. Chill dough for several hours; shape dough into tablespoon size balls. PREHEAT oven 375 F degrees. Place on ungreased cookie sheets; indent center of each cookie with thumb. 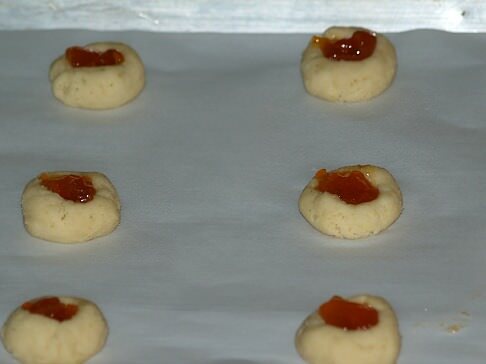 Fill thumbprint with apricot preserves and bake for 15 minutes. Cool 1 minute on tray and remove to cool completely; dust with powdered sugar. Combine brown sugar, peanut butter, shortening, milk and vanilla in large mixing bowl. Beat on medium speed until well blended; add egg and beat just until blended. Combine flour, baking soda and salt; add to creamed mixture and beat on low just to blend. Shape dough in 1 inch balls and roll in granulated sugar. Place on ungreased cookie sheets 2 inches apart; bake for 6 minutes. Press cookies immediately in centers with back of measuring spoon; bake 3 minutes longer. Cool 2 minutes on baking sheet; spoon jam into each cookie and cool completely. Grease a 15X 10 inch jelly roll pan. Combine in a bowl the flour, 1 ¼ cups powdered sugar, butter, vanilla and egg. Beat mixture on low speed until dough forms; press evenly into prepared pan. Make thumbprint slightly in dough in rows of 9; 6 to each row. Spoon ½ teaspoon of jam into each thumbprint; bake 15 to 20 minutes or until light brown around edges. Cool slightly; cut into 54 bars; a thumbprint in each. Make glaze; heat chocolate, water and corn syrup stirring over low heat until chocolate melts. Remove from heat; blend in powdered sugar and rum. Drizzle chocolate mixture over warm bar cookies; cool completely. NOTE: If thinner glaze is needed stir in additional water 1 teaspoon at a time. The chocolate and pistachio is a unique combination for a thumbprint cookie recipe. Preheat oven to 350F degrees; lightly grease cookie sheets. To make COOKIES beat together powdered sugar, butter, vanilla, almond, pudding mix and egg. Stir in flour and chocolate chips; shape into 1 inch balls. Roll balls into chopped nuts; place 2 inches apart on cookie sheets. Press thumb into each cookie ball; bake 10 to 12 minutes until light brown. Cool 1 minute; moves cookies to rack and cool completely. To make FILLING combine all ingredients adding enough milk blending to desired filling consistency. Spoon scant teaspoonful into each indentation in cookies. For GLAZE melt chocolate chips and shortening over low heat; drizzle about ½ teaspoon over each cookie. Let filling and glaze cool to set up before storing. Combine flour, ½ CUP of the pecans, cinnamon, allspice and salt. In large bowl cream butter on medium speed of mixer. Gradually beat in sugar; increase speed to high and beat until light. Beat in vanilla; on low speed gradually beat in flour just to blend. Shape dough into 1 inch balls and place on ungreased baking sheet. Flatten balls slightly; press thumb down in center of each for indentation. Fill indentation with ¼ teaspoon jam; sprinkle tops with remaining nuts. Bake 14 minutes until just set; cool 5 minutes on baking sheets. Combine butter, sugar and vanilla in mixing bowl; beat until smooth. Beat in corn syrup and egg YOLKS; stir in flour and salt until blended. Cover and refrigerate for 1 hour until firm. In small mixing bowl beat egg WHITES lightly. Roll dough into 1 inch balls; dip in egg whites and roll in nuts. With thumb make indentation in center of each cookie; chill 30 minutes. Bake 20 to 25 minutes until golden; move to wire rack and cool completely. Fill centers with cherry pie filling. FOR FILLING combine all filling ingredients in small bowl. TO MAKE DOUGH cream powdered sugar, shortening and vanilla in large bowl. Add flour to bowl and mix until blended. NOTE: If dough is too dry add 1 to 4 tablespoons milk. Shape dough into 1 inch balls (1 Tablespoon dough). Make indentation with thumb in center of each ball. Fill indentation with 1/8 to ¼ teaspoon filling. Bake for 10 to 15 minutes until light golden brown around edges. Cool on racks; makes 4 dozen cookies. Combine cake mix oil, water and egg. Beat on medium speed of mixer until well blended. Drop by heaping teaspoonfuls about 2 inches apart on baking sheet. Make indentation using thumb in center of each cookie. Spoon about ½ teaspoon preserves in indentation. Bake 9 to 11 minutes; cool completely.